If you’re going to carve a pumpkin for Halloween, it seems a shame to waste the nutritious and tasty pumpkin seeds. 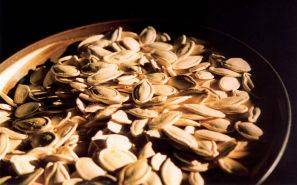 Here are several pumpkin seed recipes for roasting, toasting or spicing, so why not choose the seasoning that appeals to you most, and make a tasty batch for yourself, family and friends? When you are carving your Halloween pumpkins this year, scoop out the pulp and seeds with a scoop or large serving spoon and place in a bowl. You will need to separate the individual seeds from the pulp, but it is not absolutely necessary to wash or dry them. If you do let the seeds dry out, remember to reduce the roasting time to avoid over-cooking or burning. For saltier pumpkin seeds, let the seeds sit overnight in salted water or boil for ten minutes in salted water before trying the following pumpkin seeds recipes. Spray a baking sheet with no-stick vegetable spray. Spread the seeds evenly over the sheet and lightly spray again with no-stick vegetable spray. Roast in the oven at 300° for about half an hour, or until toasted to a golden brown color. Season to taste with salt, garlic salt, seasoning salt or Worcestershire sauce. Preheat oven to 300°. Combine about 1½ cups of pumpkin seeds with 2 tsp of melted butter and a generous pinch of salt. Spread seeds in a single layer on a non-stick baking sheet. Bake for about 45 minutes, or until golden brown, stirring occasionally. Place 2 cups of pumpkin seeds in a mixing bowl. Add 1½ tablespoons of butter or margarine, ½ tsp salt, 1/8 teaspoon garlic salt and 2 teaspoons of Worcestershire sauce; stir to combine thoroughly. Spread on a baking dish or baking sheet and bake at 275° for about 1 hour, or until golden brown, stirring occasionally. Spread 1 cup of pumpkin seeds in a single layer on a cookie sheet. Bake at 250° for 30 to 35 minutes or until dry and toasted, turning occasionally. Place 2 teaspoons sugar, ¼ teaspoon salt and ½ teaspoon of pumpkin spice in a large mixing bowl and set aside. Heat 1 tablespoon of vegetable or olive oil in a skillet, using medium heat. Add toasted pumpkin seeds and 4 tablespoons of white sugar stirring for about 45 seconds or until sugar melts. Add pumpkin seeds to sugar and spice bowl, stirring seeds to coat completely. Let cool and serve. Preheat oven to 300°. 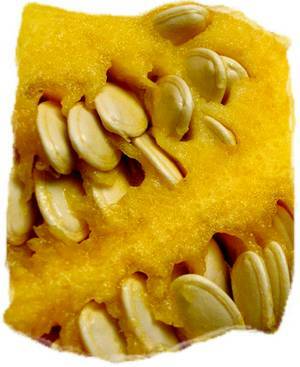 Wash and pat dry about 2½ cups of pumpkin seeds to remove strings of pumpkin pulp. Grease a baking sheet with 1 tablespoon of melted butter. Spread seeds evenly over baking sheet and sprinkle with 1 teaspoon of salt. Bake for 15 minutes, stirring every five minutes to loosen and turn over seeds for even baking. Heat a little oil or butter in a cast-iron skillet or heavy-bottomed fry pan. Add cleaned and rinsed seeds, stirring constantly as seeds begin to roast. They will puff up a little as a they cook. Remove from the pan when the seeds are roasted to a nice golden color. Add salt, spices or your choice of seasonings. Wash 2 cups of pumpkin seeds to remove traces of pulp; pat dry with paper towels. Toss with 2 tablespoons olive oil or canola oil and 1½ teaspoons salt. Spread in a single layer on a baking sheet and bake at 300° for about 45-55 minutes, stirring or shaking occasionally. If you are rushed for time, combine 1 cup of washed and dried pumpkin seeds with 1 tablespoon of oil in a microwavable dish. Microwave on high for 2 minutes, remove from microwave and stir. Continue microwaving at 1 minute increments, removing to check and stir until seeds are dry and crispy. Season with salt to taste. If pumpkin seeds are not eaten with a day or two, store in an airtight container in the fridge for up to six weeks.